Perennial peonies add interest to the garden all spring and summer long. They bloom profusely through spring and early summer, then offer lush green and red tinged foliage until the first frost of fall. There are varieties with single and double flowers that bloom in a range of bright colors. While peonies are a staple in many garden beds, they are also suitable for use in pots, planters and hanging baskets. Peonies are planted from underground root systems, called crowns, that are usually available at garden centers for purchase in fall. Fill 12-inch diameter pot, that is as deep as it is wide, two-thirds full with a moist potting mix. Use pots that have pre-drilled drainage holes in the bottom so that excess moisture can readily drain. 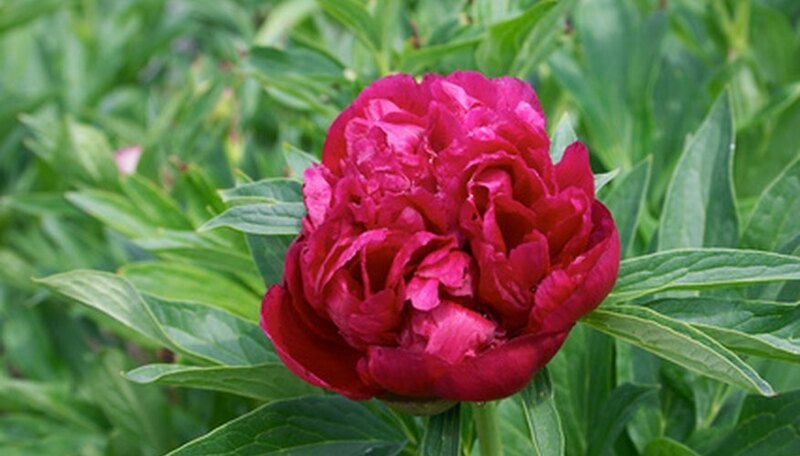 Set the peony crown on top the soil in the planter so that the red growing buds are facing upward. Cover the crown with soil so that the top of the crown sets 1 to 2 inches beneath the soil surface and so the top of the soil is 1 inch beneath the rim of the pot. You may need to place additional soil under the crown in order to plant it at the proper depth, depending on the thickness of your crown. Water the soil until the excess moisture just begins to drain from the bottom of the pot. Apply a 5-10-5 analysis soluble fertilizer with this irrigation, following package instructions for fertilization amount. Set the container in an area that receives at least six hours of sunlight a day. Water as necessary to keep the soil moist but not soggy. Cover the soil with a 1 inch layer of straw mulch after the first fall frost to help protect the crown from winter chill. Alternately, bring the peony indoors and set in a sunny window. Remove the mulch in spring or bring the pot outdoors once frost danger is past. Water every one to three days as necessary to keep the soil moist. Peonies require watering when the soil surface begins to feel dry. Begin fertilizing with the soluble fertilizer when new growth appears in spring. Fertilize monthly until the plant once more goes dormant in fall. Plant the peony crowns in fall right after purchasing them. Peonies may take two to three summers before they reach their full size. Combine peonies with summer annuals in 18-inch or larger pots for a more complete potted arrangement. Pots dry out much more quickly than garden beds. Check soil moisture daily to ensure the peonies do not suffer drought stress.